free revelation. If you are one of the many who suffer from a food intolerance to gluten, milk, nuts, soy, or other popular foods, you may feel alone in the world of food options. Join us to cover the basics of eating with allergy restrictions. We’ll review gluten free baking tips, substitutions and you will receive tried and true recipes for use at home . Equally important to removing the allergy causing food is making sure the remaining diet is providing optimul health. Learn some superfoods to add to your restricted diet. 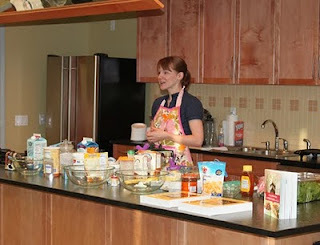 Gluten Free class sponsored by Dr. Bloom and NUCARE Integrative Health Center. All recipes will be gluten free and dairy free. Join certified holistic nutrition educator, Laura Schmitt, as she shares her favorite “autism diets” on the go. Laura will share menu planning suggestions and alternative recipes that fill critical gaps, enabling families to send healthy low allergen lunches to school and on the go. She'll also discuss six different dietary paths which can help meet the needs of individuals on the autism spectrum with explanation and insights as to why these options help so many. The low allergen lunch menu items will incorporate a focus on eating for health and receiving quality nutrients through diet. All recipes will be gluten free, dairy free, and adaptable to be made egg and soy free as needed.